Mumbai, Maharashtra, India – The drive across Mumbai today for His Holiness the Dalai Lama to attend a seminar on ‘World Peace and Harmony through Interfaith Dialogue’ at the National Sports Club of India Dome included traversing the spectacular Bandra-Worli Sealink. He was welcomed on arrival by his host Acharya Dr. Lokesh Muni to a thunderous barrage of drums and horns. 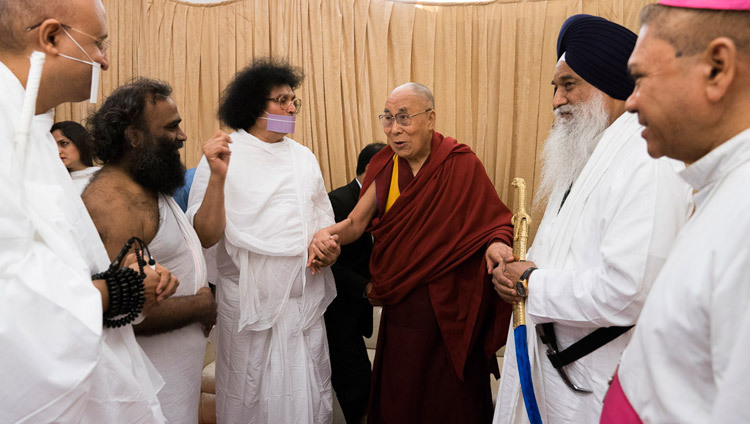 As participants in the interfaith dialogue, led by Acharya Dr. Lokesh Muni and accompanied by His Holiness and Swami Ramdev stepped out onto the stage they were met by enthusiastic applause. Together they lit a lamp to inaugurate the proceedings. Each of the guests was felicitated with a traditional shawl and a memento of the occasion. Union Power Minister Piyush Goyal was first to speak in order that he could leave to attend the launch of the first phase of the National Cancer Institute in Nagpur later in the morning. 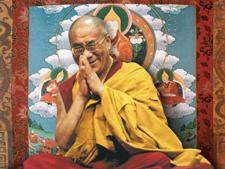 He saluted His Holiness as a “world-renowned spiritual leader we all look up to”. He added that it is a matter of pride that Dr. Lokesh Muni-ji, who has dedicated his life to peace and harmony, was leading the gathering, observing that he has made a real commitment to bringing people together from across the country. Goyal noted that climate change and terrorism are among the world’s greatest challenges at present. He remarked that India is taking steps to counter atmospheric pollution, but also needs to be aware of the damage intolerant thinking does to society. He ended with an aspiration for India to achieve the five ‘Ps’—power, prosperity, prestige, pleasure and position. Vivek Oberoi, present in his role as a peace ambassador, also left to attend the NCI function with the Minister. First of the spiritual leaders to speak about peace and harmony among faiths, Maulana Dr. Kalbe Sadiq referred to the case of the Babri Masjid currently being heard by the Supreme Court. He said that if the judgement favours the Hindu community, his community should accept it, and if it favours the Muslim community they should offer land to the other party because making a gift is a way to resolve disputes. Giani Gurbachan Singh, Chief Jathedar of the Akal Takht stated that despite differences of appearance, there is a unity among all religions because they convey a common message. Archbishop Felix Anthony Machado talked about the need for peace in our hearts if we seek to create peace in the world. What is required, he said, is unity and truth. Union Minister for Agriculture and Panchayat Raj saluted the spiritual leaders. Union Minister for Science & Technology; Environment, Forest and Climate Change; as well as Earth Sciences, Dr. Harsh Vardhan told the audience of more than 4000 that the government is determined to do what it can to take India forward, but needs the people’s support and participation. Acharya Dr. Lokesh Muni paid tribute to Swami Ramdev for sparking a widespread interest in yoga. Observing the need to include instruction on peace and non-violence, as recommended by His Holiness, in the school curriculum, he also suggested taking His Holiness’s message about resisting the urge to resort to violence to places of conflict. Swami Ramdev began with a characteristic declamation—“Bharat Mata ki Jai”. In the course of an extensive oration he suggested that China should be aware that all major religions are about peace and non-violence. Consequently, India, which is a religious country, is ready to engage in dialogue, but if her opponent wants war, she’s ready for that too. Jainacharya Namra Muni said he didn’t want to delay His Holiness since it was nearly time for lunch. “Respected spiritual brothers and … oh, no sisters? “I am very happy to participate in this wonderful meeting, among spiritual leaders who not only carry out their own practice sincerely, but also take action to solve problems they encounter in a non-violent way. Usually I tell people that I don’t consider myself as anything other than another of the 7 billion human beings alive today. Mentally, emotionally and physically we are the same. Some of my friends here have a lot of hair on their faces, which I don’t, but basically we are the same. “The entire 7 billion human beings want happiness and joy, but instead are faced by a multitude of problems—many of which are man-made. So, there’s a contradiction; no one wants problems and yet we seem to bring them on ourselves. How does this come about? As a result of our emotions, especially our destructive emotions. “Anger and jealousy are related to our sense of self-centredness and our disregard for others. Self-centredness easily gives rise to fear, which fosters irritation, which, when it blazes into anger, can provoke violence. The time has come to accept that if we’re talking about peace in the world, we have to consider peace within ourselves. “In this country, ahimsa has, for thousands of years, characterized the path of action, but it is related to being motivated by karuna or compassion. On the one hand, if we have a self-centred attitude, an artificial smile and seek to deceive others with sweet words—that’s a kind of violence. On the other, when a parent or teacher, like my tutor, uses harsh words entirely out of concern for a child’s welfare, that’s non-violent. His Holiness talked about our common human experience of being born and nurtured by our mothers. He remarked that some scientists have suggested that a mother’s physical touch is crucial to the proper development of our brains. We all grow up appreciating love and affection. We learn that jealousy doesn’t make us happy, whereas if we deal with each other honestly, truthfully and transparently, we’ll be content. He went on to observe that common sense tells us that the family next door may be rich, but if they don’t trust each other, they won’t be happy. Meanwhile, the poor family down the road have very little, but because they have trust and affection for each other, they are full of joy. He suggested that the education system, oriented as it is to material goals rather inner values, contributes to our unease. His Holiness mentioned that he is committed to raising awareness of how to bring about a happier, more peaceful world through education and common sense. Having spent 58 years in this country he has observed with admiration how religious traditions that originated here live side by side with those that came from outside. In this India is an example to the world. He said it’s unthinkable that religious faith should be a source of conflict. However, there are places now where conflict takes place within the same faith—between Sunni and Shia traditions for example—something not seen in India. “Wherever I go, I tell people that with regard to religious harmony, India is a living example that religious traditions can live together in peace and respect. His Holiness and the several spiritual leaders ate lunch together in a cordial display of friendship before departing and going their own ways.